Recently, I was asked by SGIA to contribute to their new series of “Tuesday Tech Tips” videos. I decided to discuss a topic on which I spend a great deal of time with my color management consulting clients. I believe that setting the per channel (or primary) ink restrictions is the single most important step in the color management process. Please take 90 seconds to watch the video and then I’ll provide some additional thoughts on the topic. The video addressed the basics of setting primary ink restrictions which is all done visually. On one recent assignment, we stuck with visual method and adjusted the yellow and magenta ink limits several different ways to achieve the exact red that our customer needed. Oftentimes that will be the goal of a color management project – to hit a specific group of brand colors as closely as possible with the inks available in the printer. At other times the goal of our color management consulting will be to come as close as possible to a defined industry specification like GRACoL. In that case it helps to have a visual evaluation tool like our friends at SpotOn! provide. 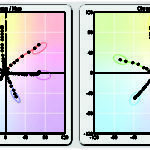 The pair of graphs below represent the resultant profiles of two recent inkjet color management assignments. On the right is an aqueaus ink set printed on photo paper that hit the Idealliance G7 Colorspace specification for GRACoL with flying colors. On the left is a dye sublimation ink set heat transferred onto a coated metal product most frequently used to produce high-end photographic enlargements. At first glance these two primary and secondary gamut maps might look similar to you. But if you look closely on the right you’ll see that the Cyan ink doesn’t quiet make it into the GRACoL tolerance ellipse for the outer end of the gamut. Also the red overprint, while it passes is pulled towards the yellow, mostly because the substrate is very yellow in color. The key is that in both cases we maximized the gamut of the given ink set, substrate and other variables outside our control. And because both of these end results passed G7 grayscale, the prints deliver on the common visual appearance promised by a combination of G7 calibration and quality ICC profile creation. To learn more about our consulting services, which include hands-on training to learn how setting per channel ink restrictions work, please schedule a call with Jim. Hi: Thanks for the helpful and informative tip. I think that the images are transposed…the text instructs the reader to refer to the image on the left as representative of one that fully matches the specification while the image on the right shows a cyan that does not quite make the spec…I think that these should be reversed. Thank you for pointing out the error. The text of the post has been corrected.